I Feel Your Pain Gabe! Penny Arcade has a funny comic up today about Gabe suffering from Game Master’s Fatigue, an illness I am all too familiar with. I’ve run many a game for many a varied group of people and inevitably it strikes – that feeling that you just don’t have anywhere to go with this story anymore, or a sense of pointlessness at all the effort you’ve poured into your masterpiece, only to have it reduced to farcical nonsense by players who just want to blow things up or shoot things, usually both. 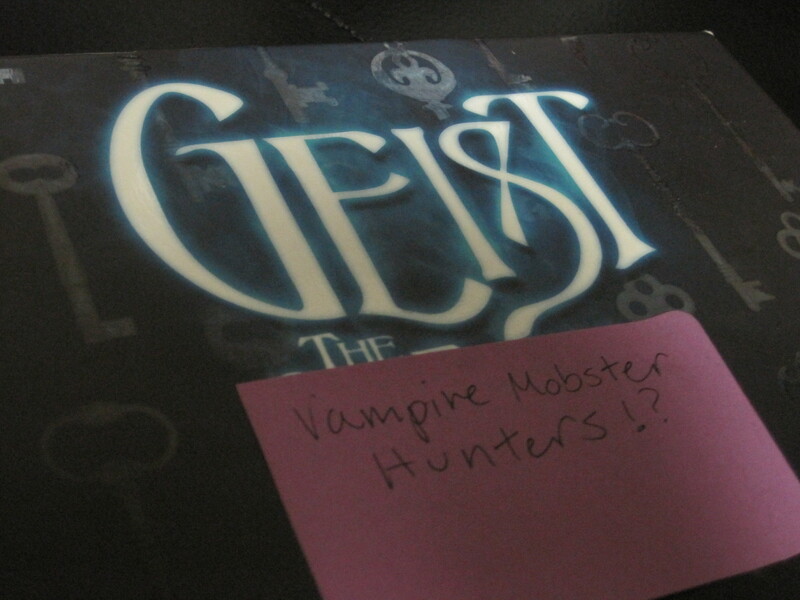 I actually had my own recent bout of GMF a couple of months ago, at the end of a surprisingly short run of Geist. It started out with so much promise, so much gritty deep character exploration just waiting to happen in the murky shadows of the World of Darkness. Alas, I had difficulty keeping a cohesive group of players, and the rotating cast made anything resembling an ongoing storyline next to impossible. It was like trying to run a Geist game set in the last season of Lost! Then it happened. I’d written up what was sure to be a spooky story of intrigue involving the local vampires that had been creeping at the edges of the last two sessions. Finally my players would be given an opportunity to find out the truth about the ancient grimoire they had fought so hard to retain! Or I might end up at the head of a table with only one familiar face and the whole game might degenerate into what I will forever refer to as the “Reservoir Sin-Eaters” game. Or “Pulp Geist”. You get the picture. There was a ridiculous gun fight and vampire mobsters were involved, that’s all you need to know. To be fair, all the PLAYERS had a great time, and I rolled with it as best I could. But my heart just wasn’t in the game anymore. However, instead of quitting in a huff, I went back to the drawing board and used the “Mirrors” alternative rules to put together something a little more tailored to my players, a little more tongue in cheek, while still retaining a general horror genre feel. A little less “Sixth Sense”, a little more “Zombieland”. Okay, a lot more “Zombieland”. Sure it’s not anything Lovecraft would be proud of, but it’s fun, and that’s the most important part of any RPG. I overflow with sympathy for ya – as you know, I haven’t run a game since that dark, dark summer when you guys ruined my JLA-style DCU game by playing Mystery Men and my carefully-planned L5R game by playing ‘that horny guy and the annoying prankster ninja girl’.